Since 1999: 3355 pageviews on this page, 35331530 pageviews on the whole site. Since 1996: 37966297 visitors to ncdsa.com, 263699 posts. Contest Info: So, it comes the time when leaves change color, the air cools, and the fuse is lit. That’s right, it’s time for the Autumn Bomb! With the amount of curiosity and excitement last year’s race created, we decided to make HVAB a two-day event this year. Day One – Race Day – Full on racing at the same hill as last year, High View: at around 35mph, it’s not the fastest course we have, but when you’re four skaters deep, all predrifting for lead spot around the first right turn hairpin, things get tricky; and to make it more challenging, we added gates to the course after the first turn. That means two crash corners, and tighter heats. There will be 64 spots available, and racing will be conducted in four man heats. Helmet and gloves are required. 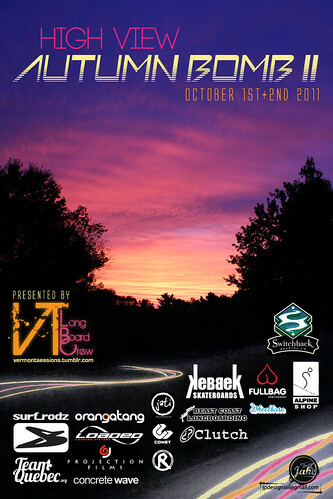 Day two – Freeride – Strictly for fun (with prizes and podiums) Jam style event on a curvaceous road. 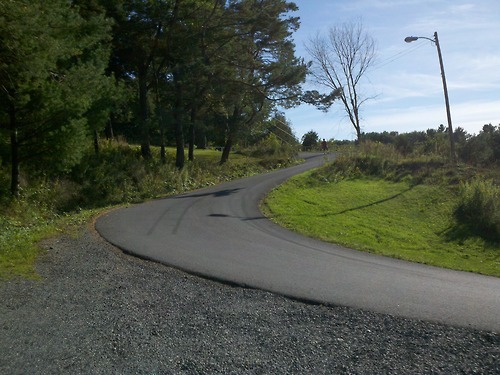 Tight and compact, The “Dam Good” Hill features three graceful turns, a right dropping into a sweeping left, then a creeping right with a sharp run out. All in over a 100 feet of vertical drop. Pavement is flat with large faced stones, making it slide effortlessly. You can ride this hill a million ways, and always learn something new. Again, helmet and gloves are required. Sponsors – We are always looking for sponsors, contributors, and volunteers. If you are interested in helping out, please send 802lbc@gmail.com for more information. We would like to thank our current and past sponsors for making High View Autumn Bomb II happen. Overall Results: Thanks to everyone who stuck it out in cold wet weather, but it was a blast skating with all of you. The temperature might have been cold, but the racing was heated. A lot of carnage, but no serious injuries. The freeride had an unexpected turnout, and it rained again, but everyone had fun and enjoyed the hill. It was great to see the young kids progress, and show interest in the sport. Everyone was stoked on the event, and we hope to see you all next year! Pictures, videos, and write-ups to come! Check out http://www.vermontsessions.tumblr.com for all the details. 41. 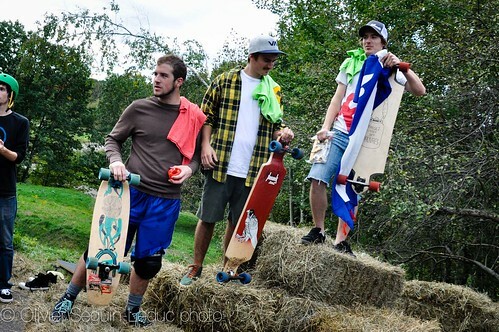 Stefan Kaiter-Snyder Providence RI Nashawtuck Longboards? All ready boy.